I still remember the first time I watched Lady and the Tramp, back when I was just a little girl. My favorite part was the Siamese Cat Song, even though I wasn’t particularly fond of those devious little cats themselves. They were just a little too stuck up for me. Plus, they were always getting into trouble and blaming the poor dog. Now I get to watch the movie with Jake and discover it through a fresh set of eyes. Disney’s Lady and the Tramp Diamond Edition on Blu-Ray/DVD releases on February 7th, just in time for Valentine’s Day. For those who somehow never heard or or seen the movie, the story of Lady and the Tramp is a classic tale of a high-society girl (or dog) falling in love with the boy from the wrong side of the tracks. Lady is a doe-eyed, innocent cocker spaniel who was raised in a ritzy part of town by a loving couple. When her family brings a baby into the mix, Lady starts to feel a little less loved, especially when mean old Aunt Sarah and those nasty Siamese cats enter the picture. Lady runs away and meets up with Tramp, a rough-looking rapscallion with a heart of gold. After sharing the most romantic spaghetti dinner in the history of meals, Tramp ends up getting Lady into a bit of trouble and she winds up in the pound. When she gets out, she realizes that a relationship with a “bad boy” just isn’t the cards for her, and her duty lies with her family. Fortunately, Tramp shows that even bad dogs can do good deeds, and the two live happily ever after. 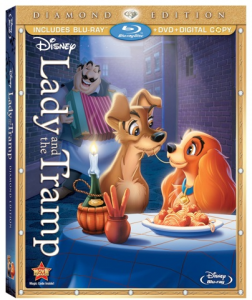 The Lady and the Tramp Diamond Edition marks the first time the classic is available on DVD. The movie itself has been in the vault for a few years now, so it’s time to introduce a whole new generation to this timeless classic. Did you know that this was the first Disney animated film ever made that was based on an original story rather than an already written fairy tale? The Diamond Edition is loaded with bonus features, including three never-before-shown scenes from the movie, a look at Walt’s story meetings, a brand-new song, the making of the film, and much more. I’ve always been a Disney fanatic, so I’m super impressed with how many awesome bonus features they managed to include in this combo.